The newly released Best Of issue of Detroit Murder City Comix recounts the tale of a Hamtramck shooting. Several years ago in the column “Toast of the Town” I wrote about an incident that happened in the mid-1980s or so. The column was specifically about the demise of the Hamtramck Pub, which was once part of the triangle of rock venues Hamtramck boasted of at that time. The former Hamtramck Pub, at 2048 Caniff, burned down in 2011. I was playing in a band during those days — in the 1980s — and we played there at least once a month. But the most memorable night was one where I wasn’t actually there. “A good friend of mine, Rick Metcalf, was there one Saturday night when the Vertical Pillows were playing. After the show, he got into his car, parked across the street from the hall next door, and all of a sudden felt a sudden hot flash of pain in his left leg. “Unbelievably, a stray bullet fired from a crazed nut from the hall pierced through the car door and into his leg. “Rick spent I don’t know how many months in a hospital bed at Detroit Receiving – one of the worst emergency rooms and hospitals to find yourself in. “He now got a metal rod holding his leg together. “In situations like this people often joke about things to soften the blow. I think it was Rod (one of the former owners) – or maybe Rick? – who came up with the joke about being able to get a “shot and a beer” at the Pub. “I also remember Rick recounting his Hamtramck police experience when the cops came. For some reason – maybe panic? – he pulled his car into the gas station down at the corner and waited for police and an ambulance to arrive. 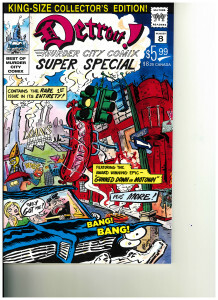 The reason I bring this back up is that Rick was part of a two-man team that wrote and drew “Detroit Murder City Comix.” And in one of those many issues Rick recounted the tale. While the comix came to an end, Rick (who was the writer) and Kent Myers (the artist) have put together a Best Of issue wherein you can read all about that infamous night – one of many in this colorful town. It’s a fun read, trust me. You can get a copy by going online to kentmyers.com\comic.html. It sells for $10.